Food bars are convenient because you can take them almost anywhere, and a protein bar without sugar may be a better choice than a high-sugar bar with less protein if you are trying to regulate your blood sugar levels or control your weight. 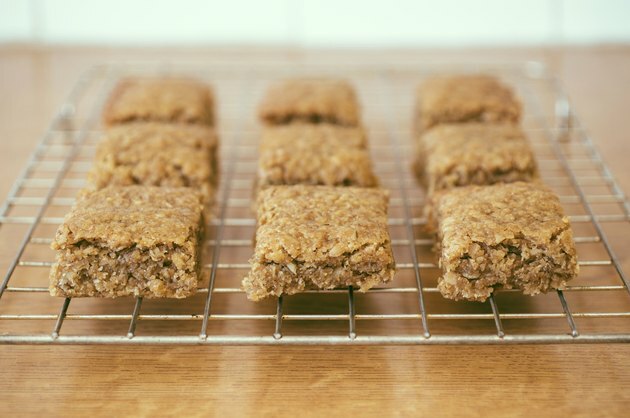 The sugar-free protein bar should meet your individual needs for calories and nutrients, and it should taste good. There are many brands of sugar-free bars to choose from. Optimal Protein diet bars are high-protein bars that are not only free from sugar, but also free from gelatin, an animal-derived ingredient. Each bar has 190 calories and 2.5 total fat, including 1.5 g saturated fat. They have 20 g high-quality protein from whey and soy, which provide each of the essential amino acids you need to get from your diet, according to the Harvard School of Public Health. The bars have 18 g sugar alcohols, and they have sucralose as a non-nutritive sweetener. Chocolite protein bars from HealthSmart are good choices for smaller snacks because each one only weighs 34 g, or just over an ounce, and has 95 to 100 calories. They have 9 g protein from whey and soy, and they are especially useful for increasing your intake of dietary fiber, a filling nutrient. Each bar has 9 g fiber, or 36 percent of the daily value. The bars only have 4 g sugar alcohols, and flavors include cookies and cream, triple chocolate fudge, peanut butter, cashew caramel and chocolate turtle. If you prefer to eat all-natural foods, one of the best kinds of protein bars without sugar may be Doctor’s CarbRite diet bars. Each provides 21 g protein, and they have no artificial sweeteners such as aspartame, saccharin or sucralose. They have 190 calories, 4 g fat and 2 g cholesterol-raising saturated fat, or 8 percent of the daily value. They have 19 g total sugar alcohols, which are sugar substitutes that may lead to diarrhea when you eat too much of them, according to the Mayo Clinic. Individual tolerance varies, but you may feel effects with an intake of 10 to 50 g.
Thinkthin high-protein bars may be good choices if you would like to try some flavors that are not common among other sugar-free protein bars. ThinkThin bars come in chocolate covered strawberries, chocolate espresso, dark chocolate, tangerine creamsicle, lemon cream pie and white chocolate. Each has 230 calories, 9 g fat and 3 g saturated fat, and they have 20 g protein whey, caseinate and soy proteins.. They have 25 g total carbohydrates, including 14 g sugar alcohols.